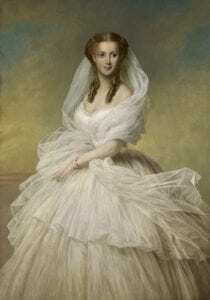 Alexandra of Denmark married the Prince of Wales, Albert Edward (later to become King Edward VII) on March 10, 1863. Britons everywhere believed her to be the most beautiful woman they had ever seen. Tall, slender, with large hazel eyes, and long flowing red hair, both men and women of Great Britain viewed her as a goddess. This adoration for Alexandra expressed itself in some peculiar ways among women of the UK. Naturally they copied the style dresses that she wore. And, because Alexandra wore a choker to hide a scar on her neck, women all over Great Britain wore chokers as well. Then there was the “Alexandra limp.” In 1867, Alexandra had a desperate battle with rheumatic fever which left her with a noticeable limp. And women copied that too. First, they would wear shoes with different-sized heels to help them walk with a limp. Then shoe manufacturers met this demand. They specially made stylish shoes that would help women limp along as they walked. What is somewhat sad about the whole affair is that, while all women longed to be like Princess Alexandra, she would have loved to be more like them. She was ashamed of her scars and mortified over her limp which, she believed, robbed her of any gracefulness. That seems to be the way things always are. Nobody seems to be happy with who and what they are. Everyone seems to be driven along by feelings of inadequacy or self-hatred. Girls hate their own appearance and beat themselves up for not looking more like Barbie. Women who are physically endowed with beauty and grace, believe it makes them look weak and vulnerable. So they disfigure themselves with body modifications, so they can look more “lean and mean.” More and more men and women are displeased with their own gender. They will mutilate their bodies in order to become someone else. Perhaps most tragic is that our culture – and even our government – encourages this self-hatred. They hail such deviancy as expressions of bravery. Self-hatred is the underlying current that fuels much of our environmental movement which continually vilifies human beings. Instead it portrays animals, trees, and all of nature as the good after which we should model ourselves. You don’t need the approval of others. You already have your heavenly Father’s approval. Friend, the wonderful truth is that you and I are exactly what God designed us to be. He endowed every one of us with gifts, abilities, and a certain assortment of physical, spiritual, emotional, and intellectual attributes. These gifts uniquely fit us for specialized tasks that only we can accomplish. God doesn’t want you to be someone or something else. In love He chose your color, gender, body configuration, personality traits and abilities. You are made to God’s own specifications (Psalm 139:13-18). That is all the validity you and I will ever need. That is all the authorization to live that you and I will ever need. You don’t need the approval of others. You already have your heavenly Father’s approval. God cannot help smiling when He looks at you, for in you He always sees something of Himself. Let God love you. He loves you just as you are. Run into His loving arms. His divine embrace is the place of ultimate healing and peace. Dear Father in heaven, open my eyes to Your love for me. Help me to flee into Your loving arms. Bring healing to my wounded spirit, I pray. Amen.